Adam Sandler once sang about the Lonesome Kicker, but the kicker has nothing on the punter. As far as fans are concerned, the punter is the offensive lineman of special teams--as long as you don't hear his name, you're happy. When he takes the field, that means your offense failed. The closest a punter gets to points is when he has the privilege of holding the ball for the kicker, and nobody mobs the holder after the game winning field goal. 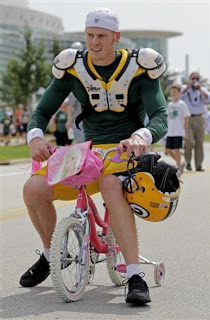 Yet last Sunday Green Bay punter Tim Masthay was the MVP of the game. And I don't think its debatable. Field position played a huge factor in the upset victory over the Jets--so huge that Masthay won the NFC Special Teams Player of the Week award, a rarity for the position. After the Packers' offense sputtered time and time again, Masthay was there to save the day, kicking the ball eight times without a single shank and giving the Jets offense more field than it could handle. 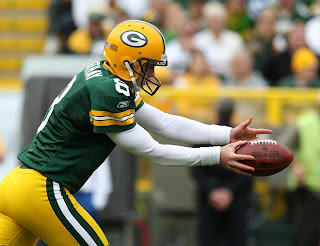 And its been a long time since the Packers could rely on a punter to do that. Jeremy Kapinos. Derrick Frost. Jon Ryan. BJ Sander. Bryan Barker. Josh Bidwell. These are the names of the 4th down drop-kick specialists over the past 10 years, and those who didn't have a noodle leg generally treated the area past the 20 yard line as a launching pad for the endzone. Sander stands out as the worst, being an enormous bust as a 3rd round pick who actually sat out his first year and was gone after his sophomore season. On the other end of the spectrum, Ryan was the best of the bunch, if only because he had the strength and athleticism to tackle the returner after he outkicked his coverage. Wrap your head around this stat: No Green Bay punter has pinned more than 2o punts inside the opponent's 20 yard line since Bidwell in 2002. To put this in perspective, we're at the halfway mark in the season and three punters have 19. Unless your offense rivals the 2007 Patriots, your team punts enough that the punter should be able to crest 20 inside the 20 annually. But Sunday was a sight for sore eyes. Masthay dropped 5 kicks inside the 20, doubling his season total, and had a punt not caromed off gunner Brett Swain's leg, it could have been 6. His hang-time was stellar and he kicked for distance when it was needed, which combined to help keep the Jets from gaining a single yard in punt-returns. All this while the wind blew heavily throughout the game. Shawn Slocum credits the breakout game to Masthays newfound consistency with his "Aussie-style kicking." If you have no clue what that means, I was with you, but its discussed a bit in this article. To summarize, its a quick-kick where you connect more with the tip of the ball, causing it to go end under end instead of spiraling. The distance is shorter with a higher hangtime, so it's ideal for punts from around the 50 yard line. Masthay apparently did this four times, including on the final crucial punt, with much success. After the game, praise showered in on the normally unheralded punter. Fellow kicker Mason Crosby gushed over the performance, stating Masthay "changed the field like I haven't seen in a long time." Defensive leader Charles Woodson also publicly thanked him for giving the defense plenty of field to work with. But amid all this praise for his leg work, his second job as holder was overlooked. On a bad snap Masthay dug the ball out of the dirt and got the hold up for Crosby to hit the first field goal, which turned out to be all the points the team needed. Its a detail that went largely unnoticed. As punter, Masthay is used to that.